The National Agency is delegated by the European Commission to deliver the Erasmus+ programme in the UK. The UK National Agency is a partnership between the British Council and Ecorys UK, and we were appointed by the National Authority. The UK National Agency is responsible for the management and delivery of the Erasmus+ programme in the UK. Our role is to manage and deliver the decentralised parts of the Erasmus+ programme successfully in order to encourage maximum take-up of the available UK budget and maximum positive impact for the Erasmus+ programme in the UK. You can find out more about us on our about us page. In the UK, the Department for Education (DfE) is the UK National Authority for the Erasmus+ programme. 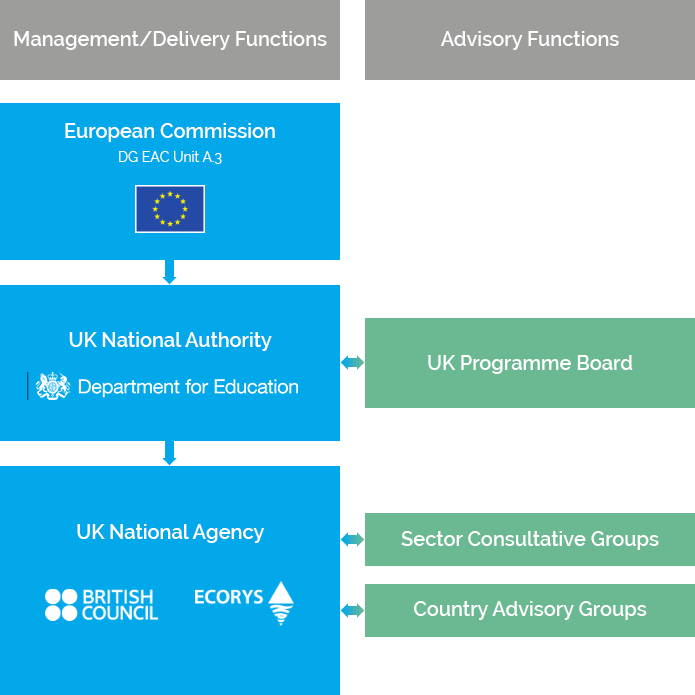 DfE is responsible for overseeing the operation of the Erasmus+ programme in the UK to ensure the UK National Agency complies with programme rules and manages the programme in an effective and efficient way. DfE also oversees the alignment of the programme delivery with UK policies, including those in the Devolved Administrations. Overall management of the programme at European level, including producing programme rules and regulations, setting funding deadlines and monitoring delivery across all participating countries. Management oversight of the programme across the UK, including appointing UK National Agency and monitoring programme delivery in the UK. Management and delivery of the programme across the UK including promotion, management of application and selection process, contracting with and monitoring projects, and disseminating and mainstreaming project and programme outcomes and impact. Made up of representatives from UK and Devolved Administration Government departments. Review of the programme in the UK and recommendations to the UK National Authority and UK National Agency. Advise the UK National Agency by providing updates on sector developments, helping to promote the programme to sectors and advising on programme delivery from the sector perspective. Groups exist for higher education, vocational education and training, schools, adult education, and youth. Membership is by invitation. Advise the UK National Agency by providing updates on country developments particularly policy developments and helping to promote the programme within a country. Groups exist for Scotland, Northern Ireland and Wales. Membership is by invitation. The UK National Agency welcomes your feedback. We also have established complaints procedures around appeals and complaints and you can find more information on our feedback and complaints page.